– Useful during Lent or any time of year. – Suggestions for pertinent videos and hymns that enhance the experience. – Devoting the first of five sessions to the Introduction establishes a solid foundation for accepting the full document. – Practical weekly action suggestions lead to lasting commitments. 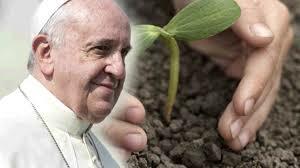 Brian Roewe’s article “Laudato Si’: reflect, study, act” in the 2/26 – 3/10/16 issue of National Catholic Reporter features resources that can bring the encyclical to life. He gives Laudato Si’ Reflection Resource the #2 spot among the five “standouts” he reviews. Scripture quotes from the appropriate Sunday are explored in the light of various Earth concerns: Water, Air, Soil, all of Earth’s species and ecosystems. As people of faith, we want to respond not only to Jesus’ suffering and death, but also to the suffering and death within creation, where God lives and acts, and we are part of a united whole: our home. Whatever the aspect of creation being highlighted, participants reflect on excerpts from each Sunday’s Scripture readings in the light of our place in the Universe Story and the presence of the divine within it from the beginning — and within us, as we respond to the threats to Earth’s gifts. Meetings include silence, prayer, input, discussion, action suggestions, and socializing. See National Catholic Reporter‘s EcoCatholic article about I Thirst: http://ncronline.org/node/71901. Delighted you find my site helpful, Bruce. Please look at the side bar of my blog to find the place to sign up to be notified when I change it. I hope this works easily for you. Delighted the site is helpful! Thanks for your comment. I appreciate your note and happy you like my site. As for your question, every morning I take time to center, to get deeper than what swirls around in my head, and become one (as much as possible) with The One: to deepen my consciousness, my compassion, and my commitment. My congregation’s charism and mission relate to finding the divine everywhere in our interconnected creation, and that “grounds” me. I listen! When I later begin to type, I remember that my fingers are being used, and try to stay open to what is meant to result. Well, that’s my goal and hope; reality is not always so tidy! I, too, spend time that seems wasted, often tossing out ideas and whole pages, and beginning again. My recommendation is that you consider those first minutes an integral part of the process — and be patient with yourself. Blessings on you and your writing! I’m missing the comment …. Sadly, no it is not. My Spanish versions of resources didn’t get much use, perhaps because I don’t have good outlets. Though I used the 2017 lent readings, they would be appropriate any time. Would it be worth my getting someone to translate it? (I shall send this message via email as well.) Thanks for asking!